Take a look at this one-stop digital solution that can manage your entire printing workflow. 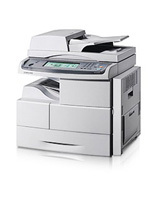 An MFP copier that can match the output of large contract-based A3 copiers, and can also scan, print and fax. Add in high performance features like duplex, high capacity paper trays and simple one touch operations and you have a solution capable of the highest workflow demands. If you need it all, the SCX-6345N can do it all. It’s a high-capacity digital duplex copier, laser printer, colour scanner and high-speed fax all in one. A touch screen makes it easy to use, and its multi-tasking flexibility makes it easy on your budget. Use it for everything from a copier-only device to a full-featured unit. Whatever your business needs, the SCX-6345 is the MFP (multi-function printer) answer. It’s quality plus quantity with the hard-working SCX-6345N. It has a monthly duty cycle of up to 200,000, and comes standard with a 520-sheet cassette plus a 100-sheet multi-purpose tray. You also have the option of adding up to three 520-sheet cassettes, and a finisher for stacking and stapling. With the optional fax kit, you can add enhanced fax features that include speed dial-up to 200 numbers, group dial-up to 100 groups, duplex send and receive, fax-to-email, secure fax, and colour fax. Use the duplex function to print received faxes double-sided, to help you save money and resources. The SCX-6345N does more for your business, more easily. SmarThru™ Office Document Management Software is built right in. It creates, stores and edits scanned images, and delivers them to each application, even to your PC. SyncThru™ Web Admin Service allows IT managers to easily manage all printers / MFPS on the network, supporting job accounting, usage metering, authentication, and more. The SCX-6345N was designed to get the show on the road. It has a wide 640 x 240 LCD touch screen that makes it so easy to use, it practically eliminates user manuals. Manage your jobs right from the control panel, and move important jobs to the top of the queue. You can even manage advanced fax functions, such as email forwarding, from the touch-screen control panel. At 45 pages per minute and up to 42 images per minute in duplex mode, the SCX-6345N gets down to business quickly and efficiently. Standard printing functions include overlay printer, delayed printing, confidential printing and job storage. Select the TonerSave mode to cut toner usage by up to 70 percent-without cutting quality. The SCX-6345N delivers enhanced scanning resolution (4800 x 4800dpi) and colour CCD, for the finest quality images. It’s an easy way to capture and store information from hard-copy documents. Store and share documents by converting them to a PDF, TIFF or JPEG file, then send them through email, FTP, SMB and Client using LDAP.